"Escape From Bizarro World: Chapter Three"
Clark recalls his father exploring his powers with him. 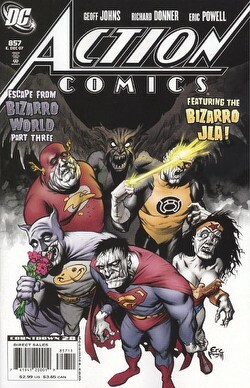 In the present, Superman, Bizarro, and Pa stand before the Bizarro JLA, which attempts to intervene, but instead catastrophically falls all over themselves before the Yellow Lantern is pulled back to Sinestro headquarters. Bizarro, seeing he's losing JLA members, uses his Bizarro vision to make more characters, Robin, Green Arrow, and Aquaman. All are promptly crushed by Luthor's Bizarro Doomsday. Doomsday attacks Pa, and Superman blasts out with a rainbow ray of vision, which hits Pa. Doomsday staggers under Superman, only to be finished off by Pa, who now has powers thanks to "Superman Vision" under a blue sun. Superman and Bizarro scheme to make things better. Superman flies around, fixing things, to the horror of the people of Bizarro World. Bizarro stops Superman and smashes things, making the people of Bizarro World think him their savior again. Pa and Superman depart in peace after Bizarro gives Pa a suit. At home, Pa amuses himself attempting to lift a tractor. On Bizarro World, Bizarro Brainiac is foiled, and Bizarro is once again the hero of the people. Story - 2: Wow, that one fell apart. I'm utterly astonished, given that this is Geoff Johns working on this. I mean, I think the last time I gave Johns a bad review was WAY back on the DC1st comics, where he did Abra Kadabra, as I recall, and it sat as ridiculous with me. Here, the problem is things that I KNOW Johns knows better than to do, which is why it's all the more astonishing. First, he critically and constantly flubs the Bizarro dialogue in this episode, something I'm pretty notoriously picky about, switching between affirmative equals negative, and bad grammar Bizarro. IE: "Me am so stupid, you are wrong!" can either mean, "I'm stupid, and you're wrong." Or "I'm so smart, and you're so right." But either way, it has to stay consistent, it can't alternate, and the former is not preferable to the latter in almost any Bizarro story for me. Also, there is some extrapolation through dialogue (though admittedly, it's justified, given that Pa would ask that question of Clark, prompting him to explain Bizarro vision). The Bizarro JLA lacks a uniqueness, and seems played for laughs, but the laughs often clunk with rare exception because the dialogue is not in Bizarro speak, and thus incoherent as opposed to coherently incoherent, if that makes sense. Also, put next to Morrison's examination in the last All-Star, this one pales in comparison. Beyond that, there's even two pages of just chuckly extra pages thrown in so we can see Bizarro Brainiac, and so we can see what we already know, that Bizarro is back in good standing with his folks. It's kind of an amateur move for a guy as good as Johns. Like I said, I'm astonished, because I know Johns knows better, and I can't believe I'm writing this, but this last part clunked. Only a few novel, cute chuckles (such as the Daily Planet being repaired, Superman vision, and Lex becoming president) kept this from a one. Art - 5: Powell really kicked this one out. His work is so awesome. My favorite panel is the Daily Planet globe moment. He GETS comic pacing, he really does, as Goon shows particularly well. The JLA were astonishing, as was every scene in this book. Even if I wasn't incredibly fond of this story, I'm still going to pull this out on a regular basis, if only to look at this art. Cover Art - 5: Happened in the issue, brutal pose, awesome art with an artistic flair. Can't beat that, can't argue with it. Fine work.